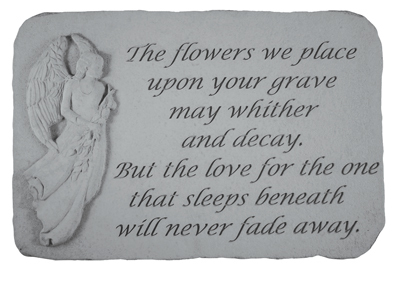 Memorial Stone - The Flower We Place..w/Angel..
Home > Memorials > Memorial Stones > Memorial Stone - The Flower We Place..w/Angel..
An angel is displayed in relief on this beautiful memorial. The memorial stone has the look, feel and weight of true stone. Made of cast stone, it is weatherproof and has year-round durability. It is guaranteed to last a lifetime. Made in the USA. Design by Pam Ballard. Framed Memorial Stone With Cross - Those We Have Held In Our Arms..